This chart has it all! 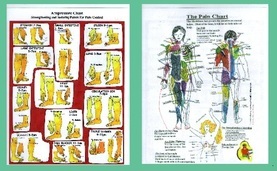 Acupressure points, muscle lymphatic points and alarm points. This is a must have for any practitioner – beginner or advanced. It is also very beneficial for anyone involved in self-care – you don’t need to be a practitioner to benefit from this easy to follow chart. This chart will increase your overall sense of well-being! Acupressure is acupuncture without the needles. Using these acupressure points will help balance the organs associated with each point, which is clearly displayed on the chart. Plus on the other side you have the acupressure / acupuncture points that can help you sedate or strengthen a meridian accordingly. This is a great reference for beginners and a nice reminder for advanced practitioners. The lymphatic muscle chart is extremely useful to the layman. All you have to do is deeply massage the area you want to balance. Our lymphatic system does not have its own pump so the only way it can move and release toxins is through exercise and massage. This is easy for the layman to understand and a great reference for beginners and a nice reminder for advanced practitioners. *Note: For individuals with a debilitating illness, go slower and remember to breathe as you massage deeply with the points. You are moving energy and it is good, but your body has a habit of holding onto a way of life that it thinks is good for you. It takes time to change a habit. The alarm points are displayed as well. You energy test to discover which organ has an imbalance. This is great for beginners as a quick reference!